יהודים בטורקיה תעלו לארץ ישראל מייד!/Jews in Turkey, Move to Israel Now! תי הפגנות מאיימות ואף פעולות ונדליזם נגד בתי כנסת בטורקיה, שנראה כי יצאו לפועל בתמיכה שקטה של המשטר - בצל אירועי הר הבית, מדאיגות מאוד את הקהילה היהודית במדינה. בלילה שבין חמישי לשישי התקיפו את בית הכנסת "נווה שלום" באיסטנבול עשרות מפגינים, השליכו אבנים לעבר בית הכנסת, בעטו בדלתותיו וניסו לפרוץ פנימה. המפגינים ביקשו למחות על הצבת המגנומטרים בהר הבית וקראו קריאות "אללה אכבר". בכניסה לבית הכנסת נאם מנהיג מקומי של מפלגת "האיחוד הלאומי", קורסאט מיצ'אן, והאשים את ישראל ב"הטרדת אחינו הפלסטינים ופגיעה בחופש הפולחן שלהם". הוא הוסיף: "או שהציונים יקחו את עצמם בידיים, או שנחזור לפה שוב". חלק מהמפגינים צעקו "אם לא תיתנו לנו להיכנס למקום הקדוש שלנו, לא ניתן לכם להיכנס למקום הקדוש שלכם". האם אתם קראתם מספיק מהשטויות האלה? האם אתם עדיין רוצים לנסוע לטורקיה לחופש? 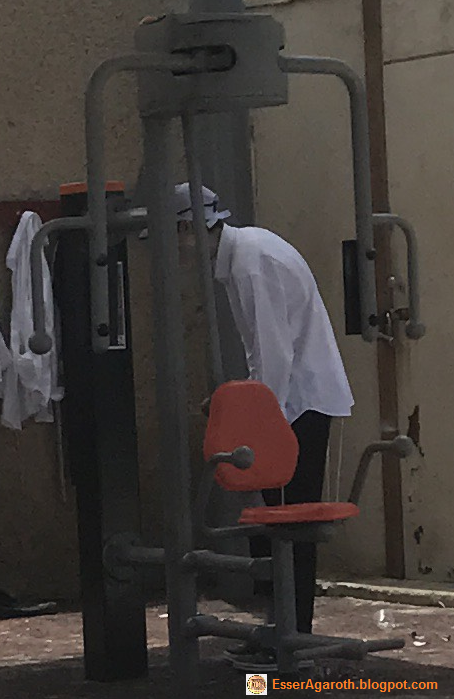 החלק הכי המצער הוא לא שהמוסלמים הטורקיים המחזיקים בסטנדרטים כפולים כאלה בלבם כמו הערבים כאן בארץ. אלא החלק הכי המצער הוא שאנחנו, היהודים, עדיין מאמינים שאפשר לגור "בשלום" עם בני ישמעאל, פרא אדם, ולשיטות דיפלומטיות בסגנון תרבות המערב יש סיכוי להצליח להביא אותנו למצב של שלום איתם. אפילו שהשיטות כאלה לעולם לא הצליחו, חוץ מתקופות זמניות. וגם הייתי אומר שעצוב מאוד שאנחנו היהודים עדיין לא נטשנו את העניין המגוחך של פלורליזם דמוקרטי. רוב היהודים, גם כאלה החובשי כיפות והמתגוררים בארץ ישראל, עדיין לא מוכנים לשמוע את זה, קל וחומר לא לקבל את זה. והם טוענים שהעניין הזה מופיע בתורה? אם כן אז איפה? או הם סוף סוף הפסיקו לנסות להוכיח לפי התורה? כשאני עליתי ארצה לפני 20 שנה, פגשתי כמה עולים חדשים מטורקיה שלמדו באוניברסיטה. אני הייתי עצוב כששמעתי שהרבה מהם "חזרו הביתה". האם המצב הנוכחי בטורקיה ישפיע להם לחזור לישראל ולהביא איתם יהודים אחרים? או הם יישארו בטורקיה, בתקווה שהמצב ישתפר, כלומר, עם ראשיהם בתוך בור בחול. וכשהמצב כן ישתפר, האם הם ישכחו בקלות את היום שבו בתי הכנסת שלהם הושחתו? ... למרות שזאת לא הפעם הראשונה, ובוודאי לא תהיה הפעם האחרונה. נשיא טורקיה רג'פ טאיפ ארדואן גינה בשבת את "הפעולות המופרזות" שישראל עשתה בדיכוי ההפגנות כמחאה על הצבת המגנומטרים. ארדואן כינה את שלושת הפלסטינים שנהרגו במהומות "שהידים". הנשיא הטורקי נמנע מלגנות את רצח השוטרים בהר הבית וכינה את הפיגוע "תקרית". נראה לי שאני כתבתי מספיק. Read enough of this tripe? Do you still want to travel to Turkey for a vacation? The sad part isn't that the Turkish Muslims, like their Arab counterparts, hold such double standards dear to their hearts. The sad part is that we Jews still believe that will can live "in peace" with these animalistic descendants of Yishm'ael. I would also say that it is also very sad that we Jews have not yet to abandon the ridiculous concept of democratic pluralism. But, most Jews, even those with kippoth and residing in Eretz Yisra'el (the Land of Israel) are not ready to hear this, let alone accept it. Where do they claim such a concept can be found in the Torah anyway? Or have they finally stopped trying. When I arrived in Israel 20 years ago, I met some Turkish Jews who were attending university here. I sad to hear that many of them "returned home." Will the current situation motivate them to come back to Israel, and bring many other Turkish Jews with them? Or will they remain in Turkey, hoping that the situation will improve, in other words, with their heads in the sand. And when the situation does improve, will they so easily forget the day their synagogues with vandalized? ...even though this wasn't the first time, and certainly will not be the last. Will they be stunned the next time, and police car leaves the scene? Will they be stunned the next time, when the police car is involved in the attack? Ambassador Dave Sharma, Don't let the door hit you on the way out. You are welcome to waste your time reading this entire piece on recent, and now former, Australian Ambassador to Israel, Dave Sharma, with all of its raising of hasbarah (publicity; from the Hebrew for explanation) and the importance of how Israel looks in the eyes of non-Jews onto a pedestal, and back handed compliments. Or you can just follow me, in reading between the lines of the most significant sections of this piece. But, first, it is no secret that bloggers and journalists alike often attempt to find unflattering photos of their subject, their targets caught in the act, if you will, to bring home their message of their hit pieces. But, who knew that Dave Sharma would provide such an unflattering photo of his own accord? (see above) Perhaps didn't have a choice, as it seems that this is the official Australian Foreign Ministry's photo of him, and where I ended up finding it only posts profile photos in black and white. So, go figure. Yet, the new Australian ambassador's official photo looks just fine (considering). Change of photo policy perhaps? Or just a poor choice on the part of Dave Sharma and and his people? Let us begin the analysis of Ambassador Dave Sharma's farewell interview from the (never disappointingly left-wing) YNET. 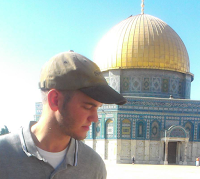 During his time here, he managed to acclimatize to Israel, fall in love with the country, and get to know it in depth. One might say that he is one of the most Israeli ambassadors to have served here, and perhaps the most popular as well. Acclimate? Fall in love? Get to know it in depth? You mean from his bubble in Hertzlya Pitu'ah, known for its limousine liberals? Yes, he loves it so much, that he encourages us to give a big chunk of it away. Even though it is not ours to give away (It's The Holy One's, Blessed Be He), and not to mention continually reinforcing Arab terrorism, by caving into their demands. (sigh) This hasn't been true for almost 20 years, at least in the big cities. Thanks for the throw in of the self-deprecating comment, YNET! Actually, the Ambassador said it, so it was more like a nasty kidney punch. Granted, the Israeli Government needs to stop being wishy-washy, stop making the same mistakes about "more talk" and "more prisoner releases" and "more land giveaways" will make one damn bit of difference with these descendants of Yishma'el, and furthermore, make up its mind already as to whether Eretz Yisra'el (the Land of Israel) belongs to it or not, stop Can it be changed, or is it a lost cause? There are terror attacks all over the world now, but other places are not branded in this manner. The youngest, Daphne, is four years old and has lived most of her life as an Israeli. Sharma says his daughter has a warm Israeli temperament and only eats Israeli food (bourekas, shakshuka and hummus). When he [David Sharma] speaks about Israel, his eyes light up, as if he were a Zionist or a Jew—even though he is not. Not a Jew? We knew that. Not a Zionist? We knew that, too. Anyone who believes that Israel must be like every other nation, and give away at least some of its Divinely promised Land could not possibly be a real Zionist. But not a Zionist, even according to the definition of the Labor Zionists who hijacked the term? Unclear. Translation: We have also succeeding in exploiting the State of Israel's desperate need for love and validation from the outside. And why shouldn't they love that we love them? After all, we almost never condemn building in the settlements (see below). For the last time, I will say that I never want to hear anyone tell me that foreign troops are not stationed in Israel. They are! Oh, and the peace treaty between Israel and Egypt? Gee. I wonder why the ambassador didn't mention Jordan as well. Did he know something was going to break down with that in advance, or is it simply in Arab nature to react in a violent tantrum anytime it gets upset? You be the judge. Seriously?! Sorry, Dave, but you cannot have your cake and eat it, too. A country cannot be considered one of the friendliest countries towards Israel while at the same time supporting the giving away of its Divinely promised lands to a people and country which do not even exist. Liberal and pluralistic nature, its freedom of press and freedom of expression...? Oh, Dave! Where were you all this time you were ambassador to Israel?! In the bubble of Hertzlya Pitu'ah? With your head in the sand? (same thing, really) You actually missed the torture of settler kids in Shabba"k (secret police) custody? The court orders, based on police a recommendations forbidding suspects to talk to their friends? Where is the freedom of speech and expression in that? Shared (Western) morality? This is undoubtedly code for that whole Judeo-Christian Values crap rearing its ugly head again. Legitimacy and support it enjoys today? First of all, what legitimacy and support? The Australian Government supports the giving away of Land Divinely given to the Jewish People. One of our greatest friends indeed! I'm sorry. Did I say that already? Well, it bears repeating. Democracy? deMOCKracy be a nation like everyone else? We all know what that means: Globalism, assimilation of the the Jewish People into oblivion. (daughters...sons Gen.) There's that word again, "hasbara" (From Heb. root for explanation; public relations). The problem with this opinion of Dave Sharma is not that he believes that Israel should be like any other deMOCKractic nation. (Did you get that one?) The problem is that most members of the Israeli Government, Israeli citizens, and their rabbis agree with him. The hospital (Ziv Medical Center, Tzfath) has treated more than a thousand Syrians wounded in the civil war raging in the neighboring country. When the ambassador first came to Israel, he was surprised to learn Israel was treating citizens of an enemy country. I'm hoping to have Qantas do a pilot of direct flights to Israel this October, as 3,000 Australians are arriving on charter flights for the 100th anniversary events marking the liberation of Be'er Sheva from Ottoman rule in World War One (by ANZAC, Australian and New Zealand Army Corps). Based on the amusing video that the embassy produced, in which Sharma leaves a list of tips for his successor, he certainly can consider a career in acting. Yeah? Well, maybe Dave Sharma should have considered acting as a career before he took on the post of ambassador to Israel. The unfortunate truth is that Dave Sharma is like every other foreign diplomat. He is either here to deliver suggestions orders from the government he represents, or to formulate them himself, and then deliver them. And his youthful appearance, supposedly positive attitude toward Israel, and ability to say a few phrases in Hebrew is supposed to cause us to praise him slobber all over him, all the more? On the contrary. A neutral, even a hostile, government, which attempts to order us around, is at least being true to itself, and is no big surprise to us. For Esau hates Ya'aqov. And I no longer buy the "western nations naivete and ignorance" excuse, either. A fallafel-eating foreigner with a smile on his face, whose government wants us to give away land and make other concessions to people who want to eradicate us, is nothing more than a wolf in sheep's clothing. Operant Conditioning is applied to modify behavior, either to increase it or to decrease it, through reinforcement or punishment. Positive Reinforcement means adding a a desired stimulus to increase a behavior. Negative Reinforcement is often confusing to people. It actually means to take something away, as oppose to mean something unpleasant. For example, putting on a seat belt takes away that annoying beeping sound, encouraging an increase in our seat belt putting on behavior. Positive Punishment does not, in fact, mean something like making some each too uch ice cream. Rather, it means adding something undesirable, such as the proverbial, electric shock. Negative Punishment means punishing by taking something away, such as your child's dessert, cell phone, or car privileges. Because maybe that'll teach 'im! In the case of this kitten, I used food to increase the "coming close to me" behavior. Other factors are involved, of course, such as the kitten's habituation (getting used) to my presence. By pairing lip smacking/kissing sound (stimulus) with the food (positive reinforcement), and I can train this kitten to then come to me, in the absence of the reinforcement (food). Guest Post: היהודים סוף סוף מתעוררים?/Are Jews Finally Waking Up? אני רוצה לקחת את ההזדמנות עכשיו להודות למחבלים ערבים, בני דודים הישמעאלים שלי, לדבר אחד: סוף סוף, סוף סוף, יהודים כותבים פוסטים בפייסבוק על המצב הביטחוני בהר הבית (מי/מה/מתי/איפה/מדוע/ואיך) ו"מתעוררים"?? למציאות הגועלת נפש/על הפנים במקום שיחפרו של ראשיהם באדמה כשהם עושים 24.7. כמה מתאים שהם מבצעים את הפיגוע במשך ה"3 שבועות" המפורסמים ומזכירים לנו מה עדיין חסר לנו במדינה "היהודית" שלנו. 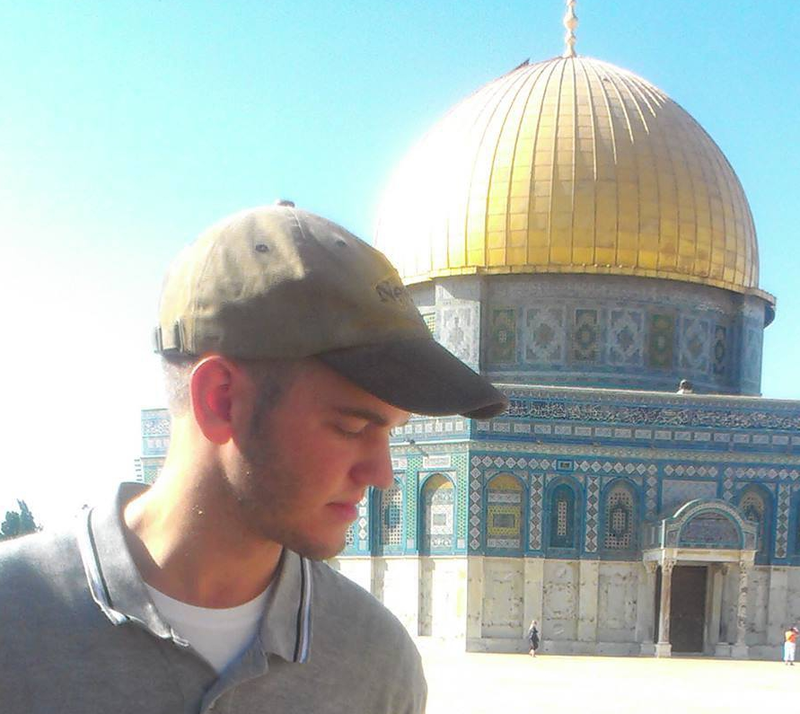 I would to thank the Arab terrorists, my Yishmaelite cousins, for one thing: finally Jews are posting statuses about the temple mount situation (who/what/when/where/why/how) and are "waking??" up to the reality instead of burying their heads in the sand like they do 24/7. How fitting they do it during the 3 weeks and REMIND US WHAT WE STILL LACK IN THIS "JEWISH" COUNTRY. All you need are the first, few paragraphs of this op-ed. You can read the rest of the above rant -- which is completely devoid of anything even remotely Jewish -- if you really want. Or you can go do something more productive with your time. Now, let's go through first, few paragraphs, step by step, shall we? First of all, what is Zionism? Zionism is the concept that the Jewish People has an inherent connection to Eretz Yisra'el (the Land of Israel), and that it is ours, and no one else's. The concept of Zionism originated where, you may ask? Hertzl? The United Nothings United Nations? The Balfour Agreement? Zionism originates from The Holy One, Blessed Be He, who promised us this Land, and transmitted this promised to us through His Holy Torah, given to Moshe Rabbenu. The Torah is also the only justification for the Jewish People's claim to the Land, not because we were here first. We weren't. The Canaanites were, and they The Almighty took it away from them. Any declaration or law created by humans, which allows, encourages, proclaims, or enforces the Jewish People's connection, to Eretz Yisra'el, and any claim it has to settle and reside here can be revoked by humans, just as easily as it was created. And we are seeing this happen right before our eyes: the Oslo Death Accords, the establishment of the Pseudostinian Authority [PA], selling and giving away land to Christian groups, preparation for man-made borders with a "security" fence, etc. Democracy, or in the State of Israel's case, deMOCKracy (Yeah, I know I said that already.) is a Greek system of governance, Greek as in Hellenist, as in the assimilated, Hellenist Jews we fought against, and defeated, in the war which culminated with the re-dedication of Beth HaMiqdash (the Temple), and the creation of the holiday of Hanukkah. Because of sham conversions, acceptance of "patralineal descent," and even intermarriage according to their own definition, how many of these "liberal Jews" are even Jews to begin with? Conversions? One may not convert to Judaism through bodies which are not Jewish, and even if they were, their "judges" are disqualified from serving in such positions, due to their various distortions and denials of the Torah, primarily the Oral Torah, and other heretical beliefs, not to mention their gender. In the recent list released by Israel's Chief Rabbinate, of those individuals whose statements of "proof of Jewishness" are no longer accepted, women were conspicuously absent. Why? No need. It is already a given that they are disqualified from providing such eiduth (testimony). If one wants to "convert" to "Conservativism" or "Reformism," by all means, let them. After all, these religions are not Judaism. So, what do I care? Unfortunately, the Israeli government, as well as the [non-]Jewish Agency, accepts paperwork from these groups' clergy for the purposes of nationality. Orthodox Judaism? As if there were any other kind... I think he means Torah-observant Judaism, which is, of course, redundant. Fill the land up with those who actually think they are Jewish, so as to battle against the Torah from within. We made a mistake. We wanted to make Jerusalem a matter of consensus again, so that we Jews would finally stop fighting with each other over something that belongs to all of us. Well, you see that's the whole point, isn't it? Does it really belong to you? Yet, again, I have to ask, just how many of you are Jewish? The Ramba"m goes a step further suggesting that even if you are all really of Jewish matrilineal descent, it doesn't matter. I'll let you look this one up yourselves (Mishneh Torah, Laws of Repentance 3:14-27). Oh, and don't forget to look it up in an uncensored version. I'm sorry to hurt your egos. But, Judaism is all about asking questions. If you have been turned off by rabbis who do not answer your questions, or cannot even say "I don't know the answer, but I can research it," then continue your search for someone who can provide you with sources to support his view, and who will not make you feel stupid or embarrassed. If you have encountered rabbis who have done this to you, they you were right not to bother with them. But, if you really believe that Judaism is your heritage, and not just some wall, you owe it to yourselves to continued you search. While we were still in Egypt, the Erev Rav (mixed-multitude/false converts) cried when they were told that we were journeying to Eretz Yisra'el. Why? Because not being from any tribe, they would not inherit. They did not feel any connection to the Land. And ever since then, their descendants have been causing us problems, one of which has been not only to forsake the Land, but actively chop it up and give it away. After all, what do they care? Whereas true converts accept the Will of HaShem. Yeah, you made a mistake alright. Besides not truly investing your time and energy, blood, sweat and tears by actually residing in Israel, by intermarrying -- including marrying those with sham conversions -- is that unlike the "ultra-orthodox" and "settlers," as you call us, you are not having enough children. The Left saw this coming ages ago, and so has actively had to recruit goyim from the Former Soviet Union, airlift Christians from Ethiopia, grant special status to foreign workers, and facilitate the flow of infiltrators into Israel from Africa, in order to counterbalance the population growth of Torah-observant Jews. But, this has still not been enough. Neither has the indoctrination into diehard State loyalty through the State's educational system and IDF service. 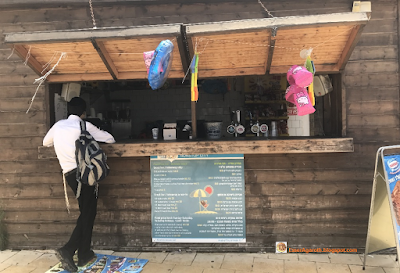 While the religious mamlakhtim (diehard State loyalists) continue to throw their kippahs off during army service, the Haredim and few [real] "settlers" allowed into the IDF do not. Be careful what you pray wish for. Because if you want democracy, then you will have to live with the results consequences. Most of the Haredim and residents of Yehudah and Shomron (Judea and Samaria) -- the proper names of these communities -- commit the greatest crime of all. Oh, and by the way, when will you finally wake up to the fact that Arabs consider Tel-Aviv to be a settlement, just as much as Hevron or Beth-El? I would say that it is only a matter of time before we vote you out of power. However, history has shown that anytime we start winning, while playing by the rules that is, you simply change the rules. Israel is no longer the Jewish people’s state. I don't count the fading Shabbos and Kashruth laws, and the Prime Minister occasionally donning a kippah and reading from the Tana"kh (The Bible). Does he really mean it? I mean REALLY mean it? For you to intermarry some more and assimilate out of existence. For those of you in Israel, for you to run away to Europe or to the U. S., when the situation gets too tough for them. Or for you to wake up finally, do teshuvah (repentance), and join us. Unfortunately, I am not optimistic about seeing too many take this last opinion, and so I am not holding my breath. My only consolation is that these people are fighting over the parking lot a wall of Har HaBayith (Temple Mount), and so they are too busy to concern themselves with Har HaBayith itself. The Black Hebrews are actually the Black NON-Hebrews. Let's call 'em what they really are, because they are certainly NOT Jewish. "The Black Non-Hebrews include thugs who beat up Jewish senior citizens in the '70's in Chicago. They came to Liberia, were kicked out of Liberia, and settled in Dimona in the Negev Desert. They have been allowed to stay here, only because they threatened mass-suicide, until the Israeli government caved." -paraphrased from Rabbi Me'ir Kahane hy"d, in a response to a question about this community on talk radio. Currently, they enjoy defacto autonomy. New members appear to come to Israel at will, or with their leadership's permission. Some now live in Tel-Aviv and other cities. They make up observances according to their leaders' decisions and "interpretations:"
They are a complete mockery of Torah and Israel. They are koferim (deniers of some or all of the Torah), just like the Christians and Muslims (Mishneh Torah, Laws of Repentance 3:17). Once, I confronted one of their youth, selling CD's next to the central bus station in Jerusalem. He was very clear when he yelled back at me, proclaiming that they are the "real" Israelites, and that we are the fakes,...and he was talking about all of us, not just one particular subgroup. Of course, there are now several infiltrators into Israel from Africa, who lay claim to our heritage and birthright, and wander around South Tel-Aviv and other areas in Israel, threatening Jews. That all being said, there are some who have successfully escaped this community, have come to realize the lies they were living, and have gone through proper conversion. Read more about the Black Non-Hebrews at Tomer Devorah. Israel Back to the Beach 5777! Beach season has been well-underway in Israel, and that includes the Hof HaNifrad (Separate Beach) in Tel-Aviv. Tel-Aviv's religious beach is located just north of the Hilton Hotel, down the hill from Gan HaAtzma'ut Independence Park. Men's days are Mondays, Wednesdays, and Fridays. Women's days are Sundays, Tuesdays, and Thursdays. 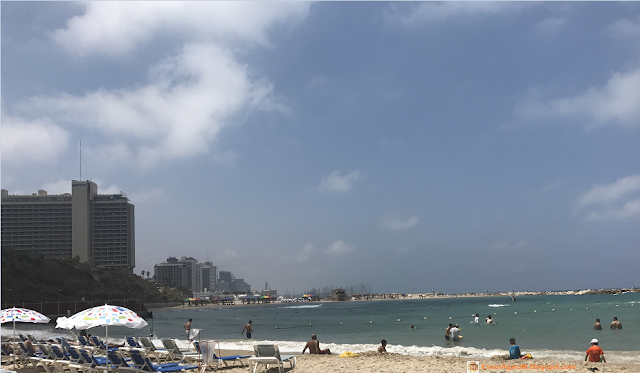 Other separate beaches in Israel divide the days up like in Tel-Aviv. Others stagger the mornings and afternoons instead. One of the criticisms of the beach's designation as a religious/separate beach is the lack of a mehitzah (divider) on its south side. It was dilapidated and in disrepair, and so why finally taken down, but has yet to be replaced. From where I was standing, nothing "exciting" can be seen anyway. Nevertheless, it should be rebuilt. Ironically the next beach south which can be seen right underneath the Hilton Hotel has been gradually developed into the unofficial gay beach. You can see the rainbow roofed shaded areas which were just never taken down after an annual celebration. 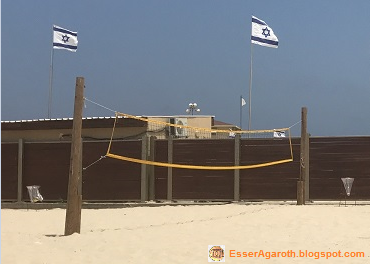 This beach sports a volleyball net, which was in use most of the time I was there on the day of these photos. So was the gym equipment. 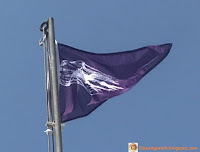 But, the most exciting scene of the day was the "purple flag," indicating the presence of meduzot (jellyfish). There were quite a few of them too. I, myself, was stung, or shot at, or whatever jellyfish do. The are very hard to see, like glass in water. Even though when they get beached, their color is a milky white. The lifeguards will occasionally catch them to show the beach goers, especially the kids, in order to educate them about this beach hazard. One thing I noticed which was new this year was at the snack bar. It seems that it still carries the usually ice cream novelties and junk food. But, it has also added four different beers on tap! Be careful, though, as alcohol can be dehydrating.